I recently broke a tooth almost down to gum level when I bit down on something hard. I am worried that I might lose it. Can it be saved? Illustration showing fractured tooth requiring a minor surgical procedure to allow the dentist to restore the tooth. 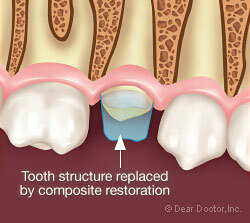 Illustration showing an increased amount of tooth structure exposed after surgery followed by a composite restoration to allow the dentist to restore the tooth. 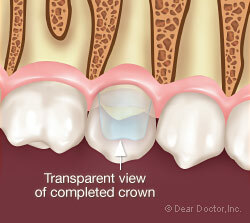 Illustration showing the full crown in place reestablishing the appearance and function of a tooth. Please go to your dentist as soon as possible. Crown lengthening is a common treatment procedure used to expose more tooth above the gum line (dentists call it sound or healthy tooth structure) where a tooth or teeth have broken or decayed at or close to gum level. In order for your dentist to fabricate a restoration, a filling or a crown, sufficient exposed tooth is required so that a restoration can be properly fitted. In other words, your dentist will need sufficient tooth exposed above the gum line to “grab on to” in order to accomplish the goal of tooth restoration or replacement. Crown lengthening is a surgical procedure that can be carried out using local anesthesia. Numbing the tooth or teeth in question as well the gum and bone that support the teeth is the same as numbing a tooth for a filling. Tiny little incisions are made inside the gum-line, both cheek and tongue side and the gum is teased open like a little flap on an envelope. A minor amount of bone is then sculpted away from the tooth (teeth) in question to actually lengthen the tooth or crown, and this is where this treatment procedure gets its name. 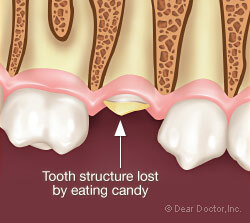 The gum is then replaced against the bone and tooth leaving no open wounds, therefore, healing is quick and uneventful. Self-dissolving sutures are often used and minor anti-inflammatory drugs are given after surgery. These drugs are used for comfort and reduce the chances of post-surgical swelling. During this procedure there should be no discomfort. There is the same amount of pressure from instrumentation or vibration from drilling as that which occurs from a typical filling. The length of time the procedure will take depends on the number of teeth that need to be crown lengthened. A typical crown lengthening procedure may take anywhere from sixty to ninety minutes. Post-operative discomfort is minimal and patients can go about normal activities the following day, avoiding vigorous exercise that may cause bleeding. Healing is usually evaluated in about a week to ten days and the tissues look pretty much healed to the naked eye. A period of approximately six to eight weeks is required prior to going ahead with final tooth restorations as it is important for the gum tissues to have fully matured. There will be limitations as to the amount of crown lengthening that can be carried out in situations where teeth have more severe fractures. These limitations are often dependent on the prognosis or long term outlook of the tooth as well as the various other options that may be available to you. Often other forms of treatment need to be considered in addition to crown lengthening. In order to avoid crown lengthening of adjacent healthy teeth, sometimes it may be necessary to first treat the broken tooth or teeth orthodontically, (with tooth movement by braces). If orthodontic treatment is required, it must be carried out prior to crown lengthening. Amazingly, this orthodontic movement pulls both the gum and bone tissues down with the tooth. The advantage of this is that only the affected tooth needs to be lengthened without involving the adjacent healthy teeth resulting in an even smile. Crown lengthening can also be used for the correction of a “gummy” smile, where real tooth length is obscured by gum tissue making the teeth look short. The procedure is used to create an appearance based on the natural tooth length, so that there is no effect on the health of the tooth. It can also be used where teeth have worn excessively. Where a broken or decayed tooth needs crown lengthening, the long term outlook for the tooth is dependent on the condition of the tooth or teeth prior to the crown lengthening procedure which will need to be carefully assessed. Crown lengthening can be carried out in combination with braces and crowns or veneers in patients who have crooked and discolored or worn down teeth. During this six to eight week healing and maturation period temporary crowns can be placed for cosmetic reasons if necessary. The decision as to how much you would benefit from this procedure can be made by your regular dentist and/or in combination with a periodontist, a specialist in the diagnosis and surgical treatment of the supporting structures of the teeth.